Stainless steel is a non-corroding steel alloy, where the additional chrome, nickel and manganese give the metal its „stainless“ character. withstands damage from impact and knocks, and is also acid-resistant. 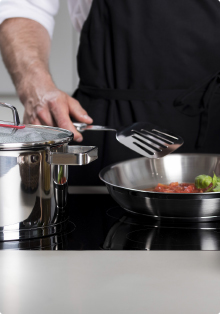 High-quality stainless steel pots and pans are provided with a special heavy bottom of copper or aluminium, often with a final steel coating, which means they conduct the heat. If you need to use boiling salted water (for example for pasta or vegetables) in a stainless steel pan, only add the salt when the water actually boils. 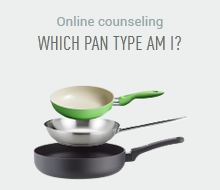 This avoids spots of corrosion on the pan base. Stainless steel is ideal for browning large pieces of meat at high temperatures. 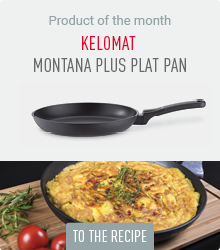 If you warm up the empty pan for a short time before adding oil or fat, sticking or deposits will be prevented. Dry your stainless steel utensils immediately after washing – this prevents spotting. Follow our other care tips to make sure that your stainless steel cookware retains its typical silvery sheen.